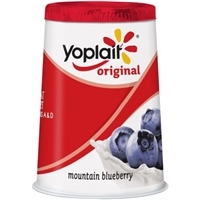 Berry: cultured pasteurized grade a low fat milk, sugar, modified corn starch. 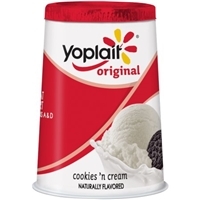 Contains 1% or less of: kosher gelatin, tricalcium phosphate, vegetable and fruit juice (for color), potassium sorbate added to maintain freshness, carrageenan,(nbsp)natural flavor,(nbsp)vitamin a acetate, vitamin d3. 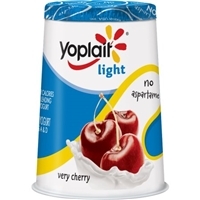 Cherry: cultured pasteurized grade a low fat milk, sugar, modified corn starch. 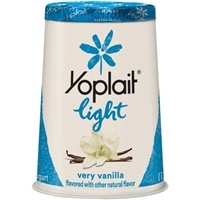 Contains 1% or less of: kosher gelatin, tricalcium phosphate, vegetable juice (for color),(nbsp)natural flavor,(nbsp)potassium sorbate added to maintain freshness, carrageenan, vitamin a acetate, vitamin d3. 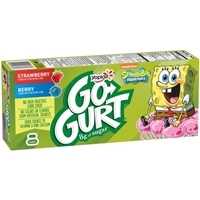 Brand/Manufacturer: Go-Gurt Yoplait USA, Inc. 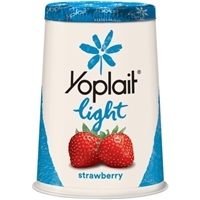 Strawberry: cultured pasteurized grade a low fat milk, sugar, modified corn starch. 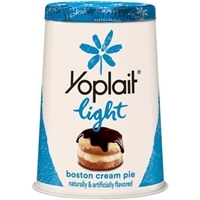 Contains 1% or less of: kosher gelatin, tricalcium phosphate, natural flavor, vegetable juice (for color), potassium sorbate added to maintain freshness, carrageenan, vitamin a acetate, vitamin d3. 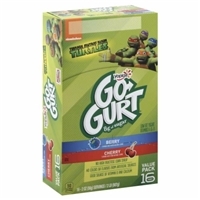 Berry: cultured pasteurized grade a low fat milk, sugar, modified corn starch. 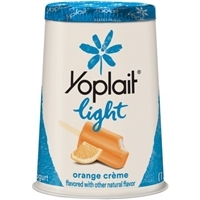 Contains 1% or less of: kosher gelatin, tricalcium phosphate, vegetable and fruit juice (for color), potassium sorbate added to maintain freshness, carrageenan, natural flavor, vitamin a acetate, vitamin d3. 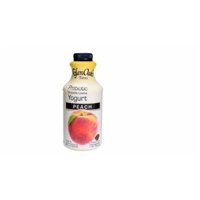 CULTURED PASTEURIZED GRADE A MILK AND NONFAT MILK, PEACH BASE (NATURALLY MILLED CANE SUGAR, WATER, PEACHES, INULIN, MODIFIED FOOD STARCH, NATURAL FLAVOR, PEACH JUICE CONCENTRATE, VEGETABLE PROTEIN, TRICALCIUM PHOSPHATE, SODIUM BENZOATE AND POTASSIUM SORBATE TO MAINTAIN FRESHNESS, ANNATTO EXTRACT FOR COLOR, ASCORBIC ACID (VIT. C)), SUGAR, MODIFIED FOOD STARCH, KOSHER GELATIN, LIVE ACTIVE YOGURT CULTURES (S. THERMOPHILUS, L. BULGARICUS, L. LACTIS, L. ACIDOPHILUS). Brand/Manufacturer: Dannon The Dannon Company, Inc.
Cultured grade a low fat milk, water, sugar, contains less than 1% of modified corn starch, whey mineral complex, natural flavors, pectin, vegetable juice (for color), malic acid, potassium sorbate (to maintain freshness), vitamin d3, sodium citrate, agar agar. Gluten free. Our cherry recipe: cultured pasteurized organic reduced fat milk, organic cane sugar, organic corn starch, organic carob bean gum, natural flavor, organic cherry juice from concentrate, gellan gum, pectin, organic fruit and vegetable juice concentrates (for color), vitamin d3. 6 live active cultures: s. Thermophilus, l. Bulgaricus, l. Acidophilus, bifidus, l. Casei and l. Rhamnosus. Our berry recipe: cultured pasteurized organic reduced fat milk, organic cane sugar, organic corn starch, organic strawberry juice from concentrate, natural strawberry flavor, natural raspberry flavor, natural flavor, organic fruit and vegetable juice concentrates (for color), organic carob bean gum, gellan gum, pectin, vitamin d3. 6 live active cultures: s. Thermophilus, l. Bulgaricus, l. Acidophilus, bifidus, l. Casei and l. Rhamnosus. Gluten free. 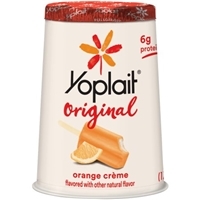 Brand/Manufacturer: Yoplait Yoplait USA, Inc.
Cultured pasteurized grade a low fat milk, sugar, modified corn starch, nonfat milk, kosher gelatin, natural flavor, tricalcium phosphate, citric acid, vitamin a acetate, colored with turmeric extract and annatto extract, vitamin d3. Gluten free. 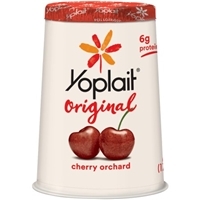 Cultured pasteurized grade a nonfat milk, cherries, modified corn starch, sugar, kosher gelatin, citric acid, malic acid, tricalcium phosphate, natural flavor, potassium sorbate added to maintain freshness, acesulfame potassium, sucralose, red 40, vitamin a acetate, blue 1, caramel color, vitamin d3. Gluten free. Cultured pasteurized grade a nonfat milk, strawberries, modified corn starch, sugar, kosher gelatin, citric acid, tricalcium phosphate, aspartame (phenylketonurics: contains phenylalanine), potassium sorbate added to maintain freshness, acesulfame potassium, natural flavor, red 40, vitamin a acetate, vitamin d3. Gluten free.phenylketonurics: contains phenylalanine. Cultured pasteurized grade a reduced fat milk, sugar, blueberries, modified corn starch, kosher gelatin, natural flavor, pectin, vitamin a acetate, vitamin d3. Gluten free. 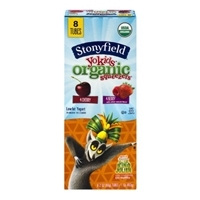 Cultured pasteurized grade a reduced fat milk, sugar, cherries, modified corn starch, kosher gelatin, natural flavor, colored with beet juice concentrate, pectin, vitamin a acetate, vitamin d3. Gluten free. 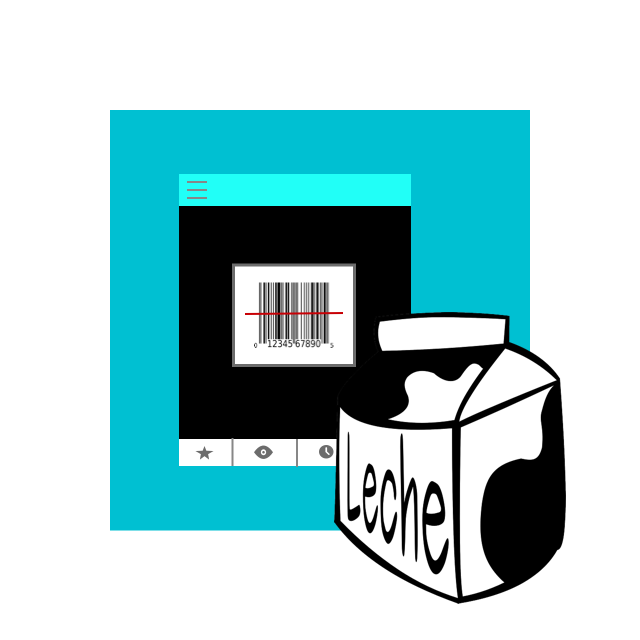 Cultured pasteurized grade a reduced fat milk, sugar, modified corn starch, kosher gelatin, orange juice concentrate, lime juice concentrate, lemon juice concentrate, natural flavor, colored with annatto extract, vitamin a acetate, vitamin d3. Gluten free. 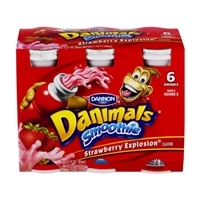 Cultured pasteurized grade a nonfat milk, modified corn starch, sugar, kosher gelatin, natural and artificial flavor, aspartame (phenylketonurics: contains phenylalanine), potassium sorbate added to maintain freshness, acesulfame potassium, citric acid, vitamin a acetate, vitamin d3. Gluten free.phenylketonurics: contains phenylalanine. 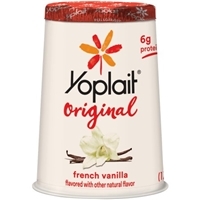 Brand/Manufacturer: Yoplait General Mills, Inc.
Cultured pasteurized grade a reduced fat milk, sugar, modified corn starch, kosher gelatin, natural flavor, vanilla beans, vitamin a acetate, vitamin d3. Cultured pasteurized grade a nonfat milk, modified corn starch, sugar, orange juice concentrate, kosher gelatin, lemon juice concentrate, lime juice concentrate, tricalcium phosphate, aspartame (phenylketonurics: contains phenylalanine), citric acid, potassium sorbate added to maintain freshness, natural flavor, acesulfame potassium, colored with annatto extract, vitamin a acetate, vitamin d3. 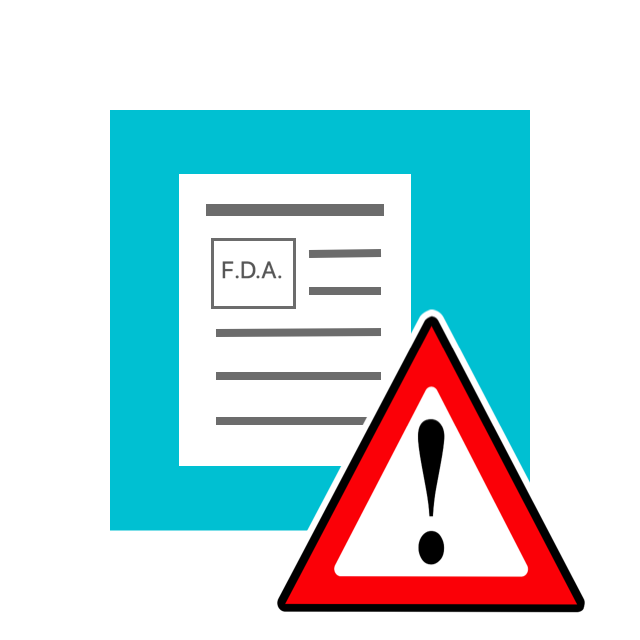 Gluten free.phenylketonurics: contains phenylalanine.